With the increased interest in River Cruising in Europe, I decided to try out one of my favorite companies, AMAWATERWAYS, for my clients. A seven night Vineyards of the Rhine and Mosel was departing from Luxembourg to Amsterdam. An amazing luxury boutique experience, but that’s another article. With a Luxembourg departure point, I couldn’t resist spending a few nights in Paris before the cruise. But less than 48 hours in Paris…what to do and more importantly – where to eat! I love the 6th arrondissement in Paris. It is a quintessential Paris neighborhood, exuding the charms of Paris life. 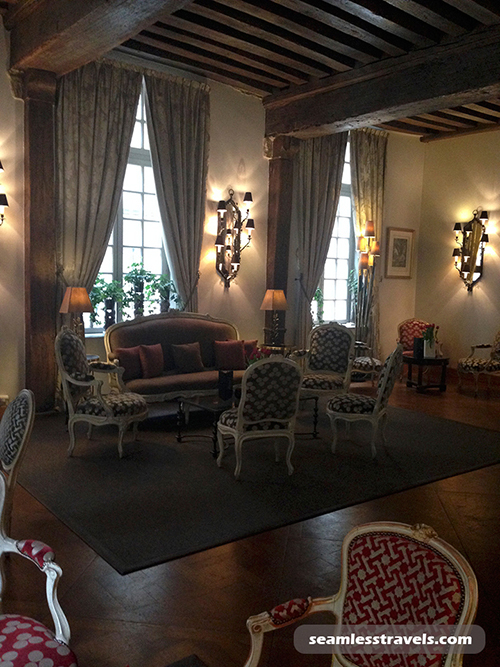 My hotel, Hotel D’aubusson, is located in the heart of St Germaine Des Pres, a distinctively elegant area in Paris. It’s less than a 10-minute walk to the famed Latin Quarter, within blocks of the Pont Neuf and two minutes to the Blvd Saint-Germain. A 15-minute walk will see you gazing at the grandeur of Notre Dame or the entrance of the Louvre, the world’s most famous museum. A highlight of my trips to Paris is always the food. Upon arrival the first thing I do is always head to a local café or patisserie. In St Germaine your options are numerous, all within walking distance. Don’t judge me, but breakfast just had to be an espresso with macaroons. Never in your life will you taste macaroons like you do in any Paris patisserie. I recommend either a Caramel au beurre salé (salted caramel) or Framboise (raspberry). And don’t get me started on the croissants and chocolate éclairs – how do they make them so delicious? I love a culture that can sit for three hours over an espresso. We had sights to see, and wanted to save space for dinner, so for lunch nothing beats a ham and cheese baguette to go– and anywhere you stop they will be delicious! Choosing a restaurant for dinner is always a delightful culinary adventure. So many choices, but only one night! A consideration that jet lag might set in from a same day arrival, a restaurant close to the hotel was a priority. If you are looking for fabulous food in an upscale location I love Les Bouquinistes, it’s a Guy Savoy restaurant (he’s an amazing multi- starred Michelin chef) and it’s only a 5-minute walk from the hotel. This is perhaps one of the best restaurants I have eaten at. It always ranks in the top 20 restaurants in the world. For other restaurant tips – If you want a true Michichlan star restaurant experience, you have to try L’Atelier Saint-Germain de Joël Robuchon Restaurant, but be warned, you will need to book early. Also, another restaurant on my list is Le Chateaubriand. In St Germaine Des Pres, you will find yourself amidst Paris’ most charming streets, lined with quaint shops, patisseries, bakeries, wine shops and cafés, making the neighborhood an absolute paradise for food lovers, shoppers, and coffee drinkers. One of the best walking neighborhoods in Paris, you’ll discover countless cafés, restaurants, boutiques, art galleries, antique shops, and some of the city’s best small art museums. One of my other fascinations of Paris is the illumination of all the bridges over the Seine. The illumination of Paris at night is magical and romantic. If you haven’t done it, the City Of Lights Paris Illumination Tour at dusk is well worth your time. Of course you have to make time for shopping. I recommend you at least pay a visit Paris’s number one department store, Galleries Lafayette. If you can get past the gold gilded balconies and beautiful clothes and apparel, go to the rooftop observation deck and stare over the beautiful city. If you have time visit the Opera, even if you just get a chance to peak in. I never got to the observation deck on this trip, as it was already time to get the TGE to Luxembourg where my river cruise was about to begin.